Google has updated its IDE for Android development, Android Studio to version 2.3 which comes with lots of new changes. Existing users can update by going to Help->Check for updates. Android Studio 2.2 was released in September last year and the next version is here in March which further enhances development experience. WebP format: Android Studio can now convert PNG, BMP, JPG, and static GIF files to WebP format. WebP is an image file format from Google that provides lossy compression (like JPEG) as well as transparency (like PNG) but can provide better compression than either JPEG or PNG. App Links: The new App Links Assistant simplifies the process of adding Android App Links to your app into a step-by-step wizard. Android App Links are HTTP URLs that bring users directly to specific content in your Android app. ConstraintLayout Improvements: ConstraintLayout just got better with 2.3 update and a view can now be defined based on aspect ratio. You can now chain multiple views to form a group on one dimension. When adding a material icon using the Vector Import Dialog (File > New > Vector Asset), you can now filter the list of available icons by category or by icon name. The updated widget palette allows you to search, sort and filter to find widgets for your layout. 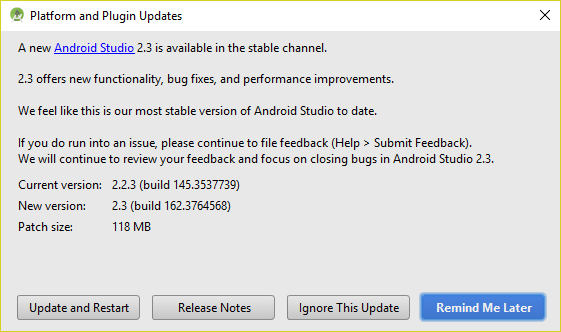 Have you updated to latest version of Android Studio? Tell us more in comments.